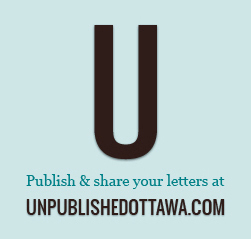 UnpublishedOttawa.com is a free social media site for letter writers living in Ottawa and across Canada. Users can publish letters, OpEds, internet comments and even rants (a la Rick Mercer), so they can be shared easily through email and social media with friends, colleagues and community. In doing so, UnpublishedOttawa.com allows users to organize their written material in one location and to build an archive of personal ‘opinion’ pieces over time. UnpublishedOttawa.com was created to empower individuals and groups, to help them extend the reach of their message and expand its potential audience. In this way, UnpublishedOttawa.com is a tool designed to encourage Canadians to become more engaged in their community and in Canada’s democracy by providing the ability to initiate a discussion and/or debate on the issues that concern them the most. With less than 66% of the population participating in federal and provincial elections, and with less than half of potential voters voting in many municipal elections, its clear Canada’s electoral systems need to be modernized so that all Canadians may participate meaningfully in our democracy. For this to happen, however, Canadians need to convince their politicians that it is in their best interest to modernize our electoral systems, to make them more open, transparent and inclusive, so more Canadians will want to participate. When we don’t participate, a vacuum is created. A vaccuum that is invariably filled by the wrong people—people who seek influence and power solely for power’s sake. This is where the ‘letter’ comes in. Letters have always been a great way to make an argument, to convey an idea and to influence a decision. Because letters take time to write well, a person who writes a letter—whether its to the editor of a newspaper, an open, personal or a letter to a business or organization—does so because he or she is passionate about the topic and is energized to voice an opinion. But, with regard to letters-to-the-editor, when your letter is not published in the newspaper, an experience many letter writers have experienced, it is deflating, discouraging and even disempowering. But, because you can’t build a successful online business by limiting content to one content type, like the 'unpublished letter', we decided to open up UnpublishedOttawa.com to include all types of letters, opinion pieces and media formats, so the site can appeal to a wide audience, both from the writer’s perspective and that of the reader. So please, take advantage of UnpublishedOttawa.com to express yourself, to share your ideas and opinions and to begin a discussion and/or a debate around the issues and topics that concern you most!